Imagine pulling up to McDonald’s, opening an app that tracks your Instagram or Twitter activity, and being able to pay for your Big Mac for having five followers, or paying for your date’s dinner using social credit accumulated through charity donations. I’m talking social currency, fairly similar to the “Nosedive” episode from Netflix’s Black Mirror, where your social status is tracked and deemed a deciding factor for all purchases, from the vacation trips you can afford to what food you can eat. While Black Mirror is meant to freak you out with its absurd sci-fi horror-based situations, technology shouldn’t frighten us. It’s time to accept it, because these advances are coming fast, and you don’t want to get left behind. Case in point, the selfie-powered vending machine that’s already been spotted on U.S. soil. The machine’s premise is simple: you push the big “start” button, take a selfie, use its randomly generated hashtag, and the moment you post it to your Instagram account, the machine will either drop some Cup Noodles, a Jump Force video game, gift cards, or Cup Noodles swag. Even with countries like Japan and Germany having insane vending machines that spit out pancakes, beer and other goodies, those all obviously run on monetary currency that we’re all accustomed to. You literally pay with your Instagram posts, and it’s one of the first steps to a Black Mirror-projected future that we must be ready to embrace with open arms. As I write this, there is someone taking a selfie and waiting for their prize to come out of that machine. That’s not even hyperbole, I literally know it’s happening at this moment because our own Foodbeast tech director Chris Abouabdo gets text messages every time someone uses it, and I hear his phone buzzing relentlessly during the workday. Yes, the two geniuses behind the machine are in-house Foodbeast developers, but I’m not just trying to hype up or toot the company horn here — I’m writing this because it could legitimately help push forward a social currency-led future. While these “FOODBEAST #DreamMachines” have sat on the shopping mall floors of The Del Amo Fashion Center in Torrance, California, and the Las Vegas South Premium Outletsin Las Vegas, they were built within the Foodbeast office walls by engineers Rudy Chaney and Abouabdo. Every once in a while, I’d run downstairs, and ask about the machine, and one of the points that stuck with me most, was Chris matter-of-factly telling me they could have “easily” made the machine run on people’s follower counts if they wanted to, giving more expensive prizes to people with more followers. They even could have hypothetically gone as far as only giving prizes to those who wrote positive things about the vending machine within their post, which shows the possibility to advance the social currency concept further. From the moment they figured out how to get the machine to run, writing the specific commands and functions was cake for two engineers of their caliber. If you need further proof that the future is now, let’s take a quick trip to China. Anyone who’s been to China knows that they’ve mostly said goodbye to cash, and primarily pay through currency apps such as WeChat. Whether you roll up to get some Yang’s braised chicken, or dancing noodles at Hai Di Lao Hot Pot, citizens pull out their phones in lieu of cash or credit. That’s just the scratched surface, however, as the country has been testing “social credit” since 2014, tracking and rewarding its citizens who conduct positive lifestyles. Yup. That’s happening right now. In 2019. The FOODBEAST #DreamMachine concept obviously wasn’t built to rank people according to their followers, likes, or anything of the sort. The goal was basically to find a cool way to give away Cup Noodles and swag. But the technology to take things a step further now exists. The machine has caught the attention of the tech world, including the raspberry pi community, which is the mini computer the guys used to build this thing. Sometimes all it takes is the wherewithal to know something is possible, and someone could easily start working on their own version of the technology. We could easily see copycat ideas, and if food brands are smart enough to push their own marketing strategies, we’ll soon live in a world where you have to take a selfie and post a hashtag to get through a Starbucks door, or automatically get 10% off your Chick-Fil-A order for sending out a tweet. I mean, we already kind of do that when checking in to restaurants on Yelp or Facebook, so the next step can’t be too much further. Now back to the Black Mirror concepts. It’s easy to scare yourself through the episode’s horror and bleak lens into technology’s darker side premise, but if this little revolutionary vending machine shows anything, it’s that if put into the right hands, technology can be used for progress. Chaney and Abouabdo spoke very candidly about the vending machine on The Katchup podcast, down to admitting that the machine actually was inspired by Black Mirror. Thankfully that wasn’t the final premise, and the machine was built with a more user-friendly experience. 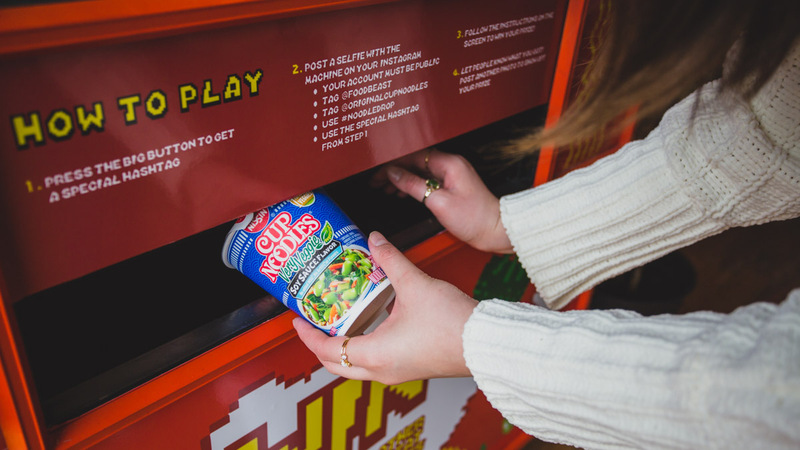 It all starts by figuring out that first step, and it appears that paying for food through social currency has already taken that first step in the form of a selfie-powered Cup Noodles vending machine. To hear the full podcast with the fathers of our inevitable social-based pay methods, Rudy Chaney and Chris Abouabdo, be sure to tune in to The Katchup and subscribe to hear more on iTunes, Spotify and anywhere podcasts can be heard.